Mobile Fidelity reissue pressed at RTI! 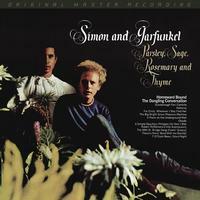 Songs for all time: Simon & Garfunkel's kaleidoscopic Parsley, Sage, Rosemary and Thyme Includes "Scarborough Fair/Canticle," "Homeward Bound," and "The 59th Street Bridge Song"
Mastered on Mobile Fidelity's world-renowned mastering system and pressed at RTI, this 180-gram vinyl LP presents the famed duo's landmark third record in superlative sound. Reflecting the perfectionist-minded nature of Bob Johnston's meticulous production and the group's painstaking arrangements, Mobile Fidelity's reissue brings to light textures, nuances, details, and microdynamics obscured on prior editions. The hyper-realistic results give you a seat at the recording studio. Simon and Garfunkel achieve the feat time and again via interwoven harmonies, folk devices, revealing contrasts, vocal blending, spiritual imagery, and soaring melodies. The material is at once beautiful and evocative, pristine and natural, serious and joyful, pertinent and accessible. And while the individual appeal of chestnuts like "Homeward Bound," "Scarborough Fair/Canticle," "The 59th Street Bridge Song," and "For Emily, Whenever I May Find Her" remain iconic, the sum of the whole makes this 1966 masterwork a paramount expression of unbridled creativity and communal vision.